The Waving Flag: What About DBMM And ADLG? What About DBMM And ADLG? This is a follow up to both this year's survey about Art de la Guerre (ADLG) and my previous survey about DBMM v1. In 2009 I ran my first ever online survey about wargaming. The subject was DBMM v1 and examined all the things you might expect. As I've already stated no one took a blind bit of notice. Even so, I decided to run another survey. This time the subject was ADLG. When designing the ADLG survey I intentionally re-used many of the DBMM questions with a view to writing a comparison post like this. Unfortunately the specifics of some questions do not allow a direct comparison despite being superficially the same. For example: DBMM uses four books of lists whilst ADLG lists are divided into seven periods. So the question "What's your favourite period?" produces very different answers. Eliminating such questions left seven directly comparable questions. So without further ado here's a short comparison of the two surveys. ADLG has a far greater percentage of players rating it as excellent and far less rating it as poor or disappointing. The average scores are 4.27 +/- 0.83 for ADLG and 3.73 +/- 1.21 for DBMM. The sample sizes were 135 & 117 respectively. Given the inherent variation I doubt that the difference is highly significant but it looks good for ADLG. Visually it's easy to see that ADLG scores higher on all ratings, bar one which is very similar, and that the questions fall into three natural groups. 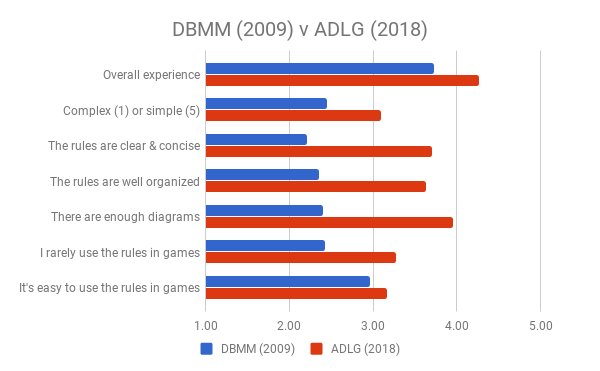 Firstly, and perhaps most importantly, ADLG was rated of average simplicity compared to the DBMM's rating of slightly above average complexity. This not a massive difference, and less than I expected, but is in line with the difference in overall experience ratings. Next, the ADLG rule book is rated far higher in terms of writing style, organization and quantity of diagrams. The standard deviation for all the above is around 1.00 so the differences look meaningful. Finally, the DBMM players made more use of the rule book but both sets of players had similar experiences trying to find things during a game. Progress? Perhaps not. In the nine years since the 2009 DBMM survey a lot's happened not least DBMM v2 which, I am given to understand, has a better layout and incorporates more diagrams. Nonetheless ADLG ably illustrates the modern trend in ancient & medieval wargaming: well produced rule books describing (slightly?) simpler rules crammed with lots of diagrams. Those planing new iterations of established rule sets, or indeed new rules, would do well to note that nine years of advancement in basic concepts and document design have yet to make it significantly easier to find something during a game. 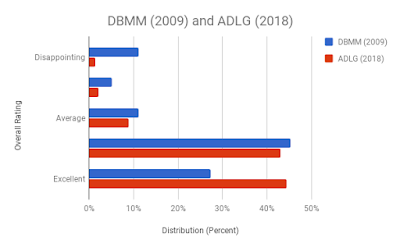 I have used all the ADLG data for this post not just the UK data so the ADLG data better matches that of the DBMM survey which was not UK specific. Both surveys used a five point scale for each rating. However, in the DBMM survey low scores were usually best whilst with the ADLG survey high scores were always best. Where necessary I have converted DBMM scores to the ADLG ranking system by "reflecting" them about the mid-point. For example an original DBMM score of 2 (Good) becomes 4 (Good). This is only important for those of you who re-reading the posts about the DBMM survey and who may notice that some of the figures used above are different. Which version of ADLG does the survey apply to? The latest one: V3 dated 2014. Interesting comparison. In your experience in the tournament context, is ALDG more or less vulnerable to rules lawyering than DBMM? I'd say less but there's a lot of players around still learning the game and applying things from the rules they used to play. I know I certainly did and probably will continue to do for a bit yet. I suppose it's one of the problems of being similar but different. Interesting concept but using DBMM version 1 from 9 years ago makes this survey misleading. The present version of DBMM is version 2.1 and it is a complete re-write of DBMM that is fundamentally different and far improved over version 1. 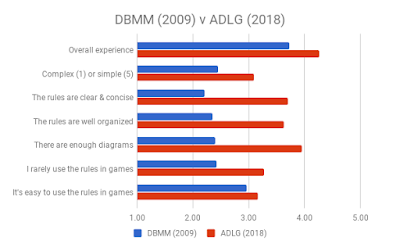 Conducting a survey of the rules is an interesting concept but it really needs to be DBMM v2.1 against ADLG. PS. as a personal observation having played competition DBMM v2 and 2.1 now for 5 years I have seen virtually no gaming the rules. That being said I believe ADLG is also pretty good in this area. Your point about DBMM v2.0 is mentioned in the main text (section 1.3). If my intention had been to compare the current versions of DBMM & ADLG directly I would have done so. The historical comparison is still a valid baseline and throws up a lot of interesting points.